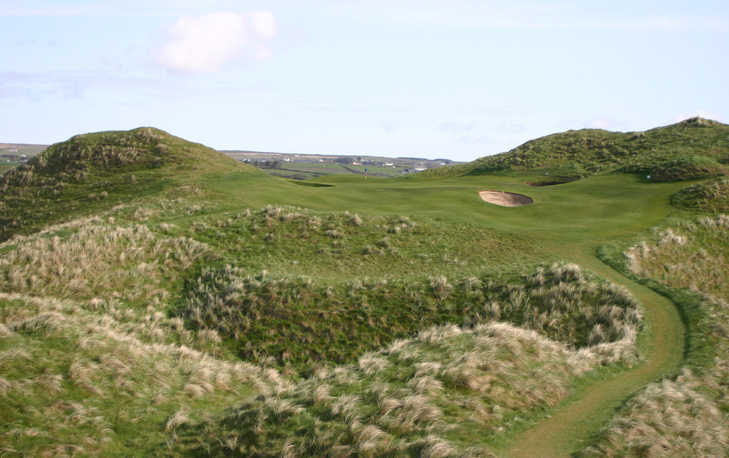 Lahinch Hole 2: This golf hole is a par five that can be reached in two depending on the wind, but the landscape is filled with pot bunkers waiting to kill that dream. The town of Lahinch provides the backdrop. 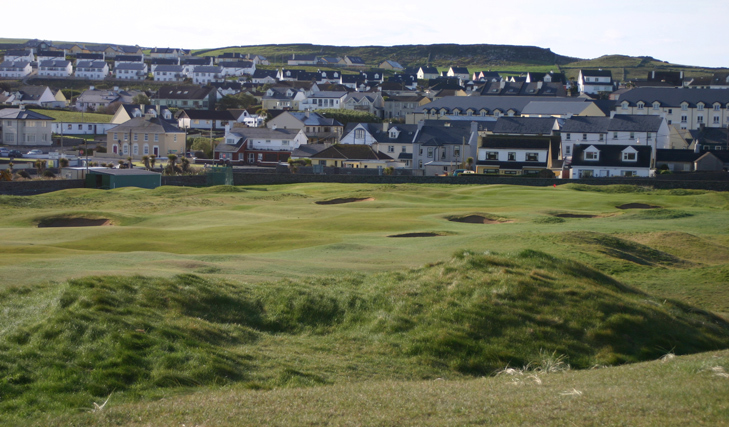 Lahinch Hole 3: The third has a blind tee shot up a steep hill. Left is worse than right, but both are bad. Once cresting the hill, the golfer is treated to his first magnificent view of the day. 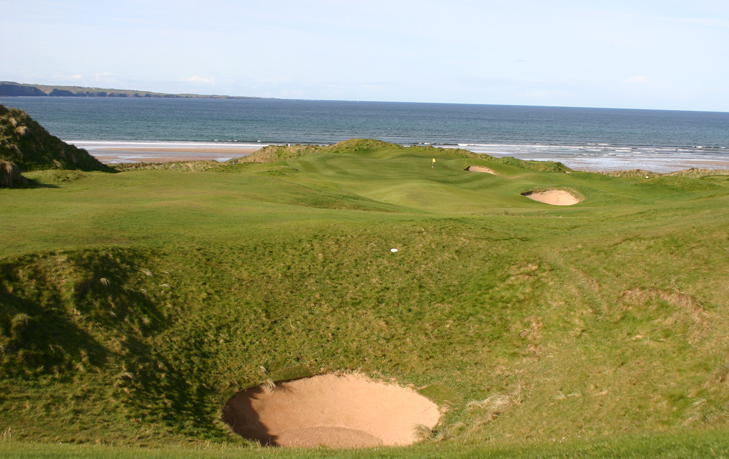 Lahinch Hole 4: This famous short par 5 is named Klondyke for the enormous dune that hides the green from the player. A good drive will allow a shot at going for the green in two, but it will be a blind approach 100% of the time. The trouble is that the green literally backs up against the OB, in the form a grass ramp leading up to the main road going through Lahinch. As the second shot is downhill and downwind, this presents a real danger of turning birdie into bogey or worse. Lahinch Hole 5: One of the most bizarre par threes in the world, designed uniquely by Old Tom Morris as the “Dell” hole. Aptly named, the green sits in a bowl between two tall dunes. However, the tee is behind one of those. Thus the shot must fly the first dune and stop short of the second. The green is only 20 yards deep and only if the pin is cut far right on the green can the player actually see it. This picture is taken from directly left of the green, the best vantage point to see the unusual green complex. 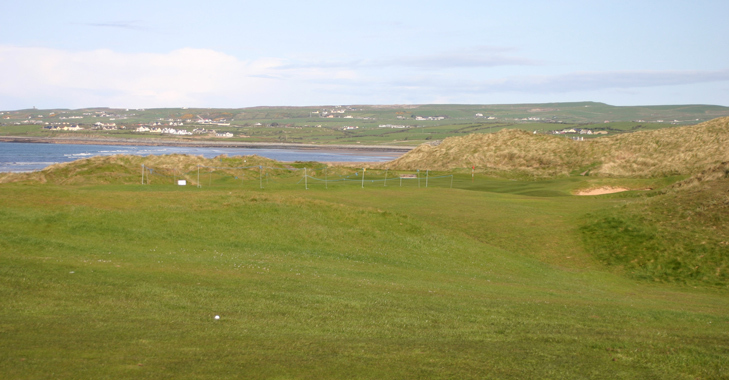 Lahinch Hole 6: After a blind tee shot to an elevated fairway, the hole turns left to a stunning green complex on the edge of the beach, with great views of the Atlantic Ocean. The player must take care on the approach as the sharp and unforgiving contours of the green will reject any wayward shot into the bunker or surrounding heavy rough, or worse. 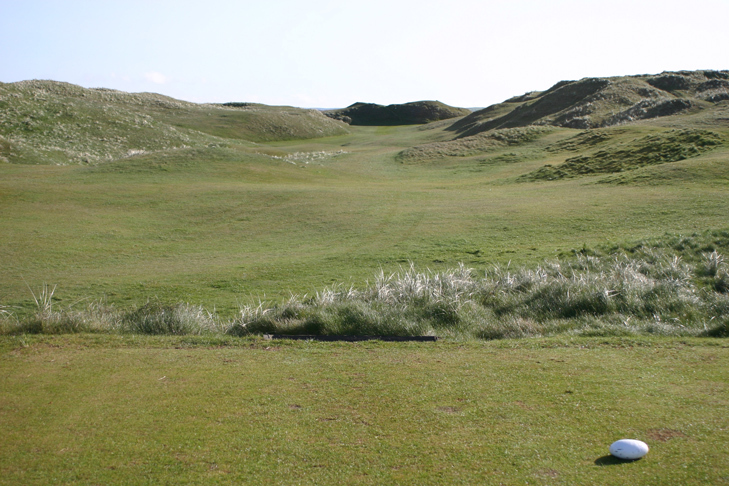 Lahinch Hole 8: This par three sits atop one heather-strewn dune and aims at the green sitting on another one between huge, deep bunkers, with a huge depression between and one right over the green. Lahinch Hole 12: The best hole on the back nine is a classic dogleg left par five that curls around a beach with a castle ruins in the background. The player can go for the green in two if a perfect, gutsy drive is hit over the corner, but at their peril if it comes up short or left. The green complex is sandwiched between the cliff left and dunes right, with bunkers in between making an exacting approach necessary. More Ireland Golf Course Reviews.